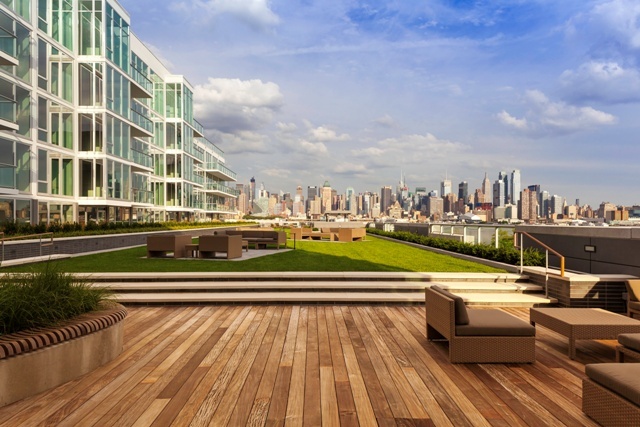 WEEHAWKEN, NJ – Lennar, which is developing the upscale Avenue Collection on the Weehawken, NJ waterfront facing midtown Manhattan, has unveiled four designer model residences at 1000 Avenue at Port Imperial that dramatically showcase the luxury condominium’s magnificent living spaces. The new models represent a variety of floorplans available at the boutique 74-unit building, including a three-bedroom, three-bath residence with a spacious outdoor balcony and dramatic views of the Manhattan skyline, two two-bedroom homes offering north-west vistas, and a unique one-bedroom-plus-den duplex residence with a private street entrance and sensational waterfront and skyline views from every room. 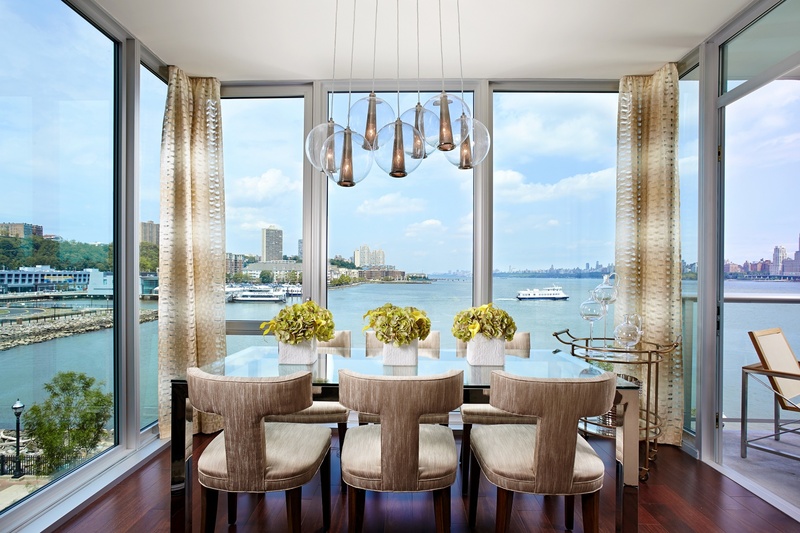 The three-bedroom model residence was designed by renowned Greenwich, CT. interior design firm, Linda Ruderman Interiors, while the one- and two-bedroom models were merchandized by Tui Pranich of Tui Lifestyle. Based in Manhattan and Miami, the prominent designer is known for creating turn-key, high-style, fully-decorated room settings, replete with luxury furniture solutions, decorative accessories, and lifestyle amenities. The new models also demonstrate the designer finishes and appointments found throughout the collection residences at 1000 Avenue at Port Imperial. These include Brazilian Chestnut hardwood floors in main living areas, and gourmet kitchens with a GE Monogram Appliance Suite including Pro Style Range, Avantium oven with SpeedCook Technology, direct vented Avantium hood to outside air exhaust, and an Energy Star®-rated refrigerator and dishwasher. Kitchens also feature under-counter wine coolers in select residences, Spazzi European cabinetry in a raked wood finish with integral handles, DalTile marble kitchen floors and marble backsplash, and granite counter tops. More than 65% of the residences at 1000 Avenue at Port Imperial have been sold. The remaining homes include one-, two- and three-bedroom floorplans ranging from 1,472 to 2,188 square feet of living space. The residences are currently priced from $1.1 million to $2 million, with immediate occupancy available. Designed by renowned Manhattan-based architect, Handel Architects, LLP, 1000 Avenue at Port Imperial strikes a dramatic pose along the Hudson River with its sleek, all-glass façade with metal panel accents. Large windows, private balconies/terraces and a dramatic third-floor outdoor plaza provide residents with desirable open-air space while maximizing the property’s spectacular sweeping views. A private suite of amenities fosters an upscale hotel-like lifestyle within the intimate setting, including Concierge services, integrated building security system, a grand salon/lobby lounge with a fireplace, a social room looking out onto New York City that includes a fireplace, TV’s, multiple gathering areas and catering kitchen; a state-of-the-art fitness center with sauna and steam showers, cardio & strength equipment and a separate Yoga room; and a conference/boardroom. A third-floor outdoor plaza area features a convenience kitchen, open lawn and planting areas, seating areas, a fire pit, sundeck and cooling spray area. An enclosed parking garage affords many homes with two parking spaces. Residents will also have access to two guest suites, available to guests of homeowners for a fee. Lennar is developing The Avenue Collection in the heart of the $2 billion master-planned Port Imperial community which stretches two miles of Hudson River waterfront across three municipalities. 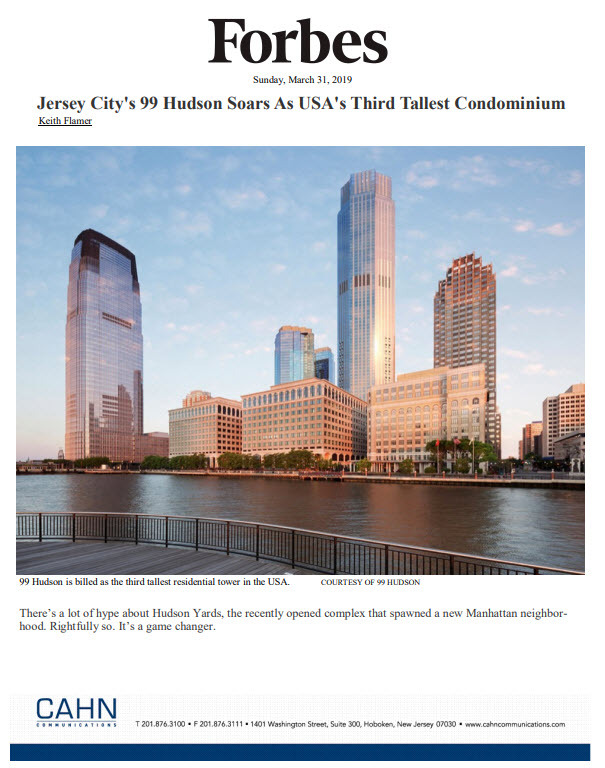 It offers residents access to a beautiful waterfront promenade with shops, restaurants, parks and an intermodal transportation system anchored by the Port Imperial Ferry terminal with service to midtown and downtown Manhattan. The Lincoln Tunnel, Holland Tunnel and George Washington Bridge are minutes away, while the New Jersey Turnpike and Route 3 are easily accessible, as is NJ Transit bus service and the Hudson Bergen Light Rail. For more information on 1000 Avenue at Port Imperial and to schedule a private tour of a furnished model home, visit www.theavenuecollectionnj.com, or call 201-210-0099. For more information on Lennar, visit www.lennar.com.